If you are looking for a book that will help train you up in praying powerful prayers based on the Word of God, then this is it! 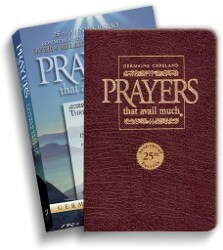 The prayers are lifted from the Bible and this 3-in 1 volume version has been updated from the previous volumes. Some of the prayers in the older book with the ‘old English’ (KJV) have been updated using more contemporary English which will make it easier for people to understand what they are praying about! I love the book! It covers such a broad variety of topics ranging from prayers for yourself, your family, finances, children including prayers for ADHD (Attention Deficit Hyperactivity Disorder), schools, the government, leaders both spiritual and political, legal matters, mental health, bereavement, marriage, schools, nations, just to name a few. If you’ve struggling with knowing how to pray or what to pray, this is a GREAT start. It lays a great foundation upon which you can develop your own personal prayer lifestyle. It’s like learning to drive or cook- you need to have the basics instilled into you which you repeatedly practice until it becomes second nature, and then you find you have that platform from which you can develop your own flair or style. I highly recommend this book! Your prayer life will go to a new level if you practice (that’s the key) the principles outlined in it. Go for it!!! You’ll never be the same! I have had this book for several years and find it to be a great source of powerful prayer. When you are going through something serious or a friend is asking for paryer sometimes it is hard to find the right scripture in the Bible. “Paryers That Avail Much” is the perfect answer. I personally had a serious family prayer need, I found the exact pray to cover the need and prayed it without doubt. All I can say is God ANSWERED that prayer. And all praise, glory and honor belongs to Him. You will use it time and time again knowing when you pray the Word of God it is the most powerful thing you can pray. I now buy copies for family and friends. They also can’t believe what a blessing, and answer to prayer, this powerful book has been. Every Bible believing Christian should have this AVAILable at all times. Guys and gals, if you’re serious about living a successful Christian life in these days and are not praying or having the effect of answered prayer as much as you would like, this book would be money well spent. Let’s get our mouth going if it isn’t already and rise up to a new level that Jesus has already paid the price for and see His kingdom come, His will be done in our lives as it is in heaven! I adore this book and have gradually continued purchasing as gifts for others. A Christian for many years but always felt at a lack of words in my prayer life. These are true confidence builders, beautiful to meditate on and I suggest speaking them out loud daily. This book was given as a gift to a “prayer warrior” friend of mine. I have had one for years and find that the specific prayers helped me to develop a more intense prayer life. My friend is immensely pleased with this book and consults it on a regular basis. I sponsor the student Christian group at my college, and one of my students introduced this book to me two months ago. It was such a blessing. The book is an integral part of my spiritual life. I read some prayers from the book nearly every night. I vacillate between rereading prayers for special intentions and choosing new prayers to see what insights I might gain. I have bought this book for my mom, for my best friend, and for one of my friends who was struggling with a spiritual concern. They have all liked it. I am sure I will buy it for others in the future. There is also a teen version that I bought for my children. This commemorative leather edition prayer book has been a great purchase. There is a table of contents that lists many different topics for prayers such as commitment, needs and concerns of the individual, single/divorced/widowed, head of household, children, group prayers, people and nations, and special needs of others. With this being a 25th year anniversary it includes Germaine Copelands Volume 1-3. 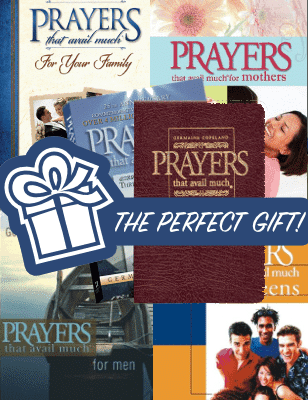 Each prayer includes a prayer and several relevant scriptures. This makes a wonderful gift. It is bound in a beautiful rich burgundy colored leather with satin place mark included. I have given this to my close friends and each of my three girls. We use this prayer book regularly and have also purchased it as a gift for many people–weddings, Christmas, birthdays, baptisms and everything in between. We’ve even given it to nonbelievers as a gift because everyone at some point comes to the end of themselves at some point and needs the words that can be found in these prayers. It’s a beautiful keepsake full of the power of God’s Word which is living and active (Heb. 4:12). I saw this book at a local store and didn’t purchase it the first time I saw it but it stayed on my mind so I went back to find it and they were out of stock. The store was able to give me the book and author’s name by my description so I was able to order it online. The book is full of very specific prayers which I like to read over to encourage me and help show me a more focused method of prayer. So it’s a handy little tool to have. Of course it’s not the replacement to any bible or church attendance. Instead it adds to the whole and can be really helpful in directing prayers. Some of the things wrote down in the book never dawned on me that I have the right to pray for. These are beautiful words and very encouraging weather reading them aloud to a group or myself. Or adopting them into my own prayer life. Again, this is not a need to have but a nice to have and the price is very agreeable for the richness received in return.